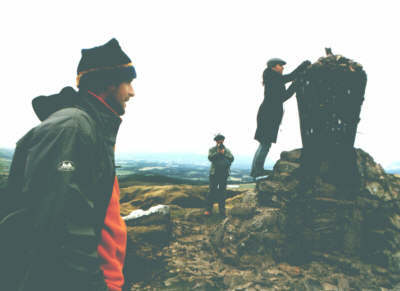 In autumn 2004, Hanging Together propose an exchange by artists from central Poland and the Forth Valley towns, relating to migrations, cultural and economic links between the two countries. A summary document can be found here. The Scottish artists visited Poland during August, including work at the Centre of Polish Sculpture in Oronsko and exhibition at Galeria XX1 in Warsaw (moving to Gorzow Wielkopolski). Then the Polish artists visited Scotland in October, including work at the WASPS Opendays and Polish Weekend in Alloa and exhibition at The Park Gallery, Falkirk. An exhibition documenting the entire project was seen at East Kilbride Arts Centre during November. 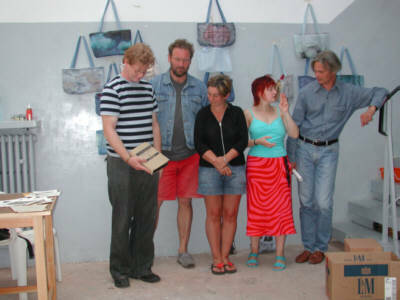 The Scottish artists are grateful to the Hope Scott Trust for their financial assistance to help realise this project. We are also grateful to A. G. Barr plc for assistance in kind. Jonathan Claxton and Karen Laing: Plaid (clear weave)"
Alicja Lukasiak: "That's the way it is"